Can you imagine going to your favorite hiking spot, taking a wrong turn, and getting stranded overnight? A few weeks back this happened to hikers descending from Mailbox Peak in Middle Fork Snoqualmie Natural Resources Conservation Area (NRCA), just outside of North Bend in East King County. Hikers are drawn to the beautiful forests, streams, wildlife, and views of Alpine Lakes Wilderness Area from the Mailbox Peak Trail, but many have stayed away because of safety concerns and environmental damage on the trail. 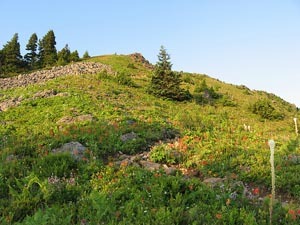 The current trail is very steep, with a 4,000-foot elevation gain in just 2 miles. This grade causes significant erosion along with dangerous conditions where hikers can become injured or lost. The Washington State Department of Natural Resources (DNR), with the help of Mountains to Sound Greenway Trust, has broken ground on a new trail and trailhead that is being built with safety and sustainability in mind. DNR looks forward to hosting a celebration for the completion of this 18-month project on National Public Lands Day, September 2013. So, what can you do? Here are three things you can do today to stay safe on the trails—and also lend a hand. 1. Safety is always first. No matter the length of your hike, always make sure you tell someone where you are going and pack the ten essentials. Be sure to register beforehand with Mountains to Sound Greenway Trust. 3. Speak up. Mailbox Peak is in the Snoqualmie Corridor recreation planning area that is currently underway with the help of a citizen-based planning committee. We are asking for feedback on what recreation opportunities the public would like to see on DNR-managed state trust lands and conservation areas within the corridor. Read the blog for more details and take a few minutes to fill out the survey.